What do you hope readers take with them after they’ve read [The Battle is O'er]? I hope they’ll feel as if they walked beside Shawn and Niall for a time, and all the rest in the story, that the inhabitants of the Blue Bells world have become people they knew and cared about. And many readers seem to very much feel that way. I hope they’ll carry with them the beautiful story of a man who recognizes his flaws and makes a decision to turn himself around. I hope they’ll remember the humorous moments and the poignant moments and smile long after the book is closed. "...I enjoyed every bit of plot that I read and could take the storyline seriously. . . . I would recommend this to lovers of fantasy novels, and now-complete series with complex storylines, characters, and worldbuilding." Clive moved in silence beside him for a time, flashing his light around the cells that opened on their right, and down another passage. He followed the passage, quickly, his mind on Niall. His brother would be searching too, neither of them knowing if Simon had crossed or not. He hoped Niall would be okay—not ambushed by Simon. He hoped he wouldn’t be ambushed himself, nor Clive, nor the chief. He doubted they could take on a medieval knight with years of brutal warfare under his belt. Shawn set the tea mug down, rose, and lifted the linen shirt made by Christina, revealing the scar. Cheers rose from the men of Glenmirril. Relief washed through Niall. Their ruse with James Angus had not entirely silenced the whispers, though Margaret had been stalwart in looking down her nose at those who did so, reprimanding them and silencing them. He was grateful the rumors had not diminished the love of the people of Glenmirril for Christina. Niall waited in the hills outside Creagsmalan as Conal, Lachlan, and Owen rode in. He and Hugh sat on a pair of boulders, watching sunrise spill light over the water beyond the town. “Sit down. We need to talk.” Angus’s voice snapped Shawn’s attention back to the hospital room. Angus sat in a wheelchair by the hospital window, wearing jeans and a heavy fisherman’s sweater, a book in his hand. He laid it down on his lap. “You’re up!” Shawn stopped in the doorway, feigning energy. In truth, he’d had multiple late nights, on top of a heavy load of arranging for the album Ben wanted out yesterday. He wanted nothing more than to be in bed, asleep. But when he collapsed in bed, he turned and rolled restlessly through the dark hours with nightmares—if he slept at all. "It is full of action, danger and romance, plus more..."
"I found the novel to have an interesting premise with realistic characters and development. I like that the story was told from the past, future, and present. Overall, it was an interesting book..."
“Good to go home to your young bride, eh?” The man gave a wink as he waved for a stable boy. Simon grinned. It felt odd and light on his face. Smiles, in his experience, had always been a deliberate tensing of muscles. This time, his features moved on their own, without his will, and his heart lifted, too. “Cat’s got your tongue,” the man laughed. “She must be a fair delight to the eyes!” He slapped his horse on the rump and melted into the crowd, leaving Simon alone and feeling foolish in the midst of the courtyard, as more men poured through the gates. Beatrice’s head shot up as the door burst open, yanking back from her husband’s embrace. “Sir Kenrick....” The guard, Erol, stumbled to his knees, shoved by a man in chain mail. Beatrice backed up, gripping her shift close as she studied her cousin. She’d not seen him in years, not since he’d been a vile boy, dropping spiders in her hair. The malice in his eyes had not changed. 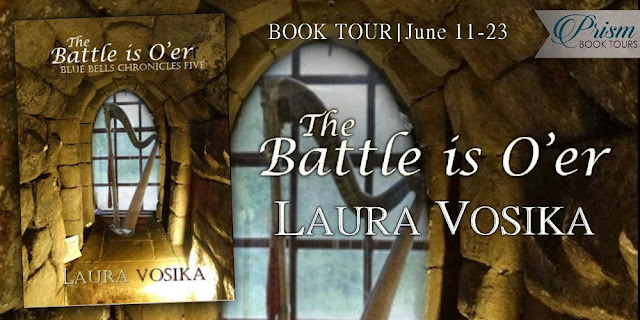 "The Battle is O'er blends the excitement of a modern thriller, with the immersive details of the best historical fiction. Vosika clearly shows her writing chops here, drawing her story forward with a cast of colorful and relatable characters living through extraordinary circumstances. I'd highly recommend this to fans of Diana Gabaldon's Outlander series." “Is he dead?” Lachlan whispered, looking at the man on the frosty ground. Owen shook his head, working at the bolts on the huge doors. “A potion is all. He’ll appear to have fallen asleep at his post.” At the same moment, they heard a shout from the courtyard. Owen eased the door open a crack. 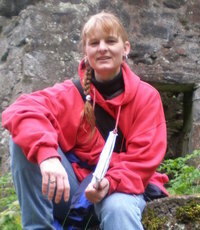 They slipped through, onto the dock that ran alongside the castle wall and pulled the door shut behind them. Lachlan scanned the river, whispering, “Conal!” His breath hung in the air. 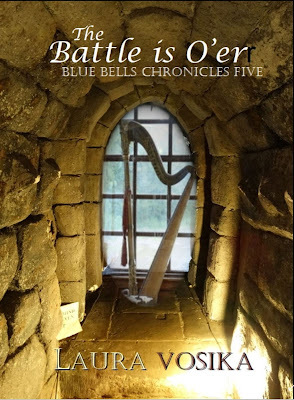 In the gripping conclusion to The Blue Bells Chronicles, just as Shawn is steadily regaining all he feared he had lost forever—his career, his son, and even Amy’s heart—he learns of MacDougall’s vengeance against Niall, for the act Shawn himself committed. He wrestles with a prophecy and an ancient letter that never changes, a letter that details the fate of his own son, if he cannot stop it—and possibly the fate of the world itself, as he learns of Simon Beaumont’s plan to use his knowledge of the future to destroy it. Shawn’s selfishness once cost him everything. His newfound selflessness may do the same. 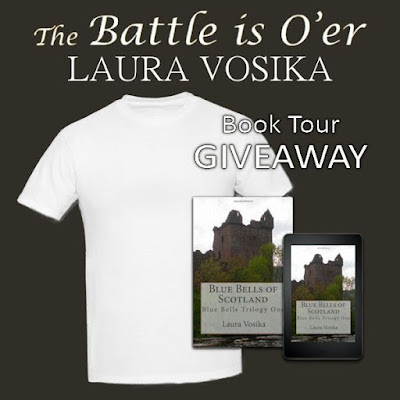 Laura Vosika is the author of the beloved series, The Blue Bells Chronicles, a tale of time travel, action and adventure, romance and redemption, ranging across modern and medieval Scotland. She runs Gabriel’s Horn Press, and is active in poetry as a member of the League of Minnesota Poets, routinely performing at local open mics. She has appeared in The Star Tribune, and on WCCO and Channel 12, and hosted Books and Brews with Laura Vosika on AM 950.